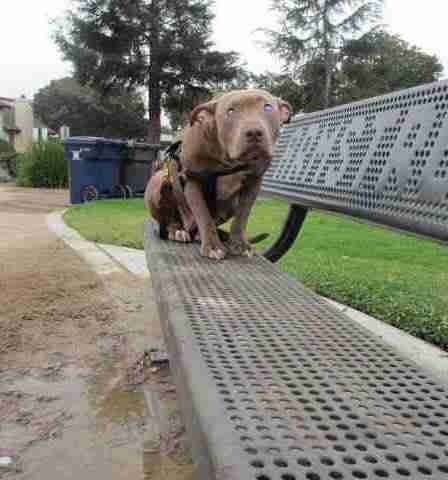 In late October, a blind pit bull named Poly was found abandoned on a park bench in Santa Barbara, California, all alone, too afraid to even move. Thankfully, Poly was taken in by a rescue, but it was soon discovered that Poly was very sick, and may not have long to live. The sweet pit bull was given up to two years tops - and maybe as few as two months. Poly was placed into foster care by Foreverhome Pet Rescue, where she spends most of her days napping and taking it easy due to her severe heart condition. While it's fortunate that Poly gets to live out her final days in a home with foster siblings and people who love her, her abilities are still very limited. She goes on car rides to Starbucks, and can take walks to the park, but if Poly gets too excited or active, she goes into a coughing fit and faints. Her condition limits her severely, but Poly's supporters have found another way for her to see the world. Poly's rescuers created a website called Flat Poly, where people can print out a picture of Poly, apply it to a piece of cardboard and take their new Flat Poly out on all the adventures that real Poly will never get to have - a sort of virtual bucket list. Since the movement started, Flat Poly has been to Los Angeles, Portland and even countries all over the world. She's hiked to the Hollywood sign, gone to the beach and met dogs from across the country. Thanks to Flat Poly, people everywhere now know her story and are sending her all of the love and support she has always deserved. Poly's condition is very testy, and just yesterday she worried her foster family quite a bit with a small medical scare. "Poly gave us a scare yesterday afternoon. She woke up from a nap (a nap where she was snoring heavily - not normal for her) and when she stood up she had a coughing fit and fainted," Foreverhome Pet Rescue posted on its Facebook page. "She got right back up and has behaved normally since the incident." Poly was taken to the doctor immediately and will be undergoing surgery sometime this month. No one knows exactly how much time Poly has left, but one thing is clear - between her rescuers, her foster family and Flat Poly, Poly is living out her final days to the fullest, and that is really what matters. To donate to Poly's cause, check out her fundraiser page. To follow Poly's progress, check out her Facebook page.